The latest tales of Monster Bike Events and cycling news from across Kent. In preparation for the Sky Rides 'Local' happening in Kent this summer, Monster Bike Events has been out and about running weekend Community Bike Workshops. The first event was at Park Wood in Maidstone where volunteers were trained to carry out essential bike maintenance and then we had a Dr Bikenstein free servicing session for local cyclists. 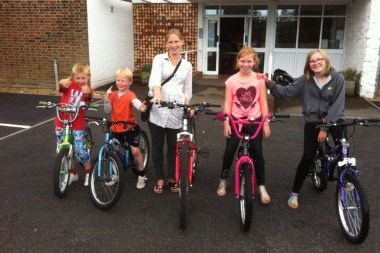 The next event was held in Dartford and was a weekend of free bike servicing along with a second hand bike sale. The weather was appauling, but just as we were packing up on the Sunday, a family came along with bikes they really wanted to ride but they were really very poorly. An hour later, they all left with bikes in tip top condition ready for the Summer. A local reporter and campaigner, Joan Francis, popped in to see us and here's her report. The next Community Bike Workshop Weekend is on 18 & 19 August at the Sheppey Healthy Living Centre, Sheerness. On Saturday we'll be training volunteers keen to help fix bikes and on Sunday we'll be providing free bike healthchecks. To volunteer please Roar For More! Just a few months ahead of the 2012 games in London, Kent kicked off the sporting fun with its own Olympic cycling event, supported by Monster Bike Events. In February, Olympic Gold Medallist and US Olympic cycling coach, Jamie Staff, flew back to his hometown of Ashford for a very special cycling event. And he brought some of his 2012 team along for the ride. The Olympic team joined local cycle champions for a special ride through the scenic Kent countryside before heading to the Julie Rose Stadium for a cycling celebration that was open to all. Experienced and new cyclists came from across Kent to join the team for a series of fun activities, including challenging the Olympic athletes to races, trying out quirky clown bikes and testing their luck in a spin competition. Everyone who came on their own bike was given a free cycle check by Monster Bike Events, including Jamie and his team! Local cycling trainer, Spencer Morgan, who organised the event said it was, “a unique opportunity for people to ride with world class athletes, inspiring children and adults to give cycling a go. A top day.” Need we say more?